They’re anchored all over Buffalo – alongside railroad tracks, in the shadow of church steeples, and next to factories and warehouses. 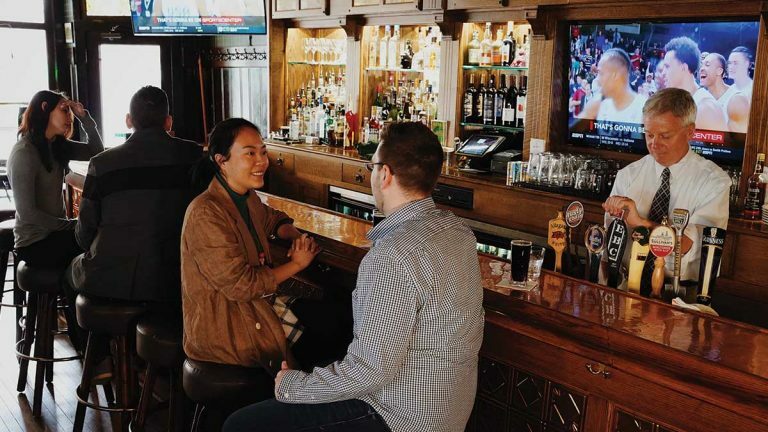 The city’s corner taverns and ethnic social clubs have long been the straw that stirs Buffalo’s drink – the glue of its neighborhoods and a meeting place outside of work that forge the ties that bind generations of Buffalonians together over a cold beer and a good conversation. While new craft cocktail bars and breweries have opened and feature exposed brick walls and Edison light bulbs, these watering holes with $3 cans of Genny Cream Ale and Utica Club have taken on a whole new meaning. Juke boxes, original wooden bars, vintage barstools and decades-old beverage coolers keep the beer extra cold and evoke a kind of cool that cannot be replicated. Here are four historic bars to wet your whistle and acquaint you with the very fabric of Buffalo. 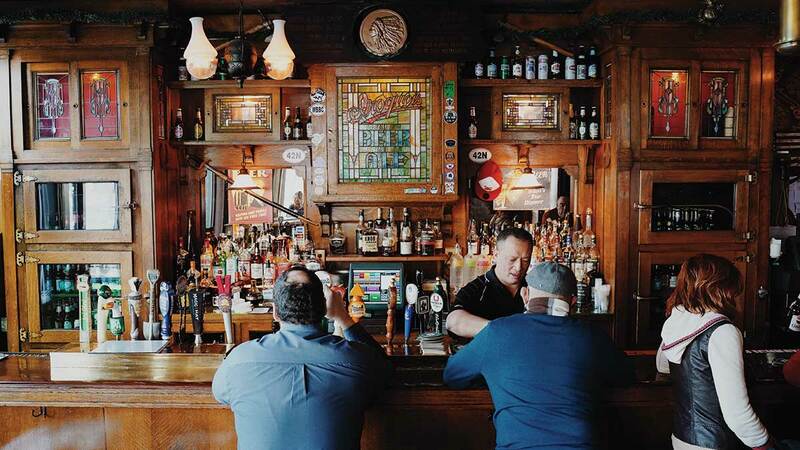 If only the walls of Ulrich’s 1868 Tavern – Buffalo’s oldest watering hole – could talk. They might share how the U.S. Secret Service stopped by when President Grover Cleveland was in town and ordered potato pancakes for the commander in chief and ex-Buffalo mayor. Or that bar staff used a pulley system behind the beverage coolers to lower beer into the basement when police came to inspect during Prohibition. These are the stories still swapped to this day at this historically German tavern on the northern edge of downtown. Wooden floors and vintage 1875 ceiling lamps greet customers walking in. Relics from throughout Ulrich’s history surround the mahogany bar, from the stained glass windows behind the counter advertising Buffalo’s Iroquois Brewing Co. to a spittoon for chewing customers. Bratwurst, Wiener schnitzel and German potato salad are still on the menu, and jars of pickled eggs and sausages line the shelf. Stepping into Rohall’s Corner is like spending an evening in your “grandfather’s old rec room,” according to owner Greg Rohall. There are ketchup-and-mustard colored walls, brown and red floor tiling, recessed lighting, glass block windows and a back wooden bar stocked with hard liquor. character intact before reopening in 2011 as Rohall’s Corner. Those 27 years of dormancy preserved the look and feel of the tavern that otherwise would have been remodeled. The original wooden coolers still keep the beer cold, including rare and vintage finds like Utica Club – one of the popular blue-collar beers of Buffalo’s industrial heyday – and Stiegl from Salzburg, Austria. Rohall’s successfully straddles a fine line between an old-time “shot and a beer” joint serving Old Vienna and Pabst Blue Ribbon to a contemporary bar offering live piano music and an extensive wine list. Its humble exterior along Amherst Street conceals one of the city’s top hidden gems. Those in the know in Buffalo’s Elmwood Village stray from its busy streets to enjoy one of its most storied watering holes. The quiet corner of Lexington and Ashland Avenues has been a gathering spot since the 1870s, when horse drawn carriages leaving Buffalo stopped by the wood-frame building for a meal. In 1941, new owner Bernie Flynn turned the place into The Place and introduced menu items that remain to this day like the “Flynnie’s Thinnie” sandwich (ham, swiss cheese and onion on toasted rye.) One of its most popular drinks is seasonal: The Tom and Jerry (rum, brandy, meringue and hot water topped with a dash of nutmeg) is such an institution at the holidays that patrons can even bring home the mug it’s served in. The Place features dark mahogany walls with forest green plaid wallpaper, a copper top bar, hardwood floors, plush green booths and brass light fixtures. It’s one of Buffalo’s only restaurants with a covered front porch – a nod to the front porches adorning the neighborhood’s Victorian homes. While the menu and décor has evolved over 140 years, The Place’s ability to connect Buffalonians of all stripes over a pint, good conversation and a warm meal has remained the same. 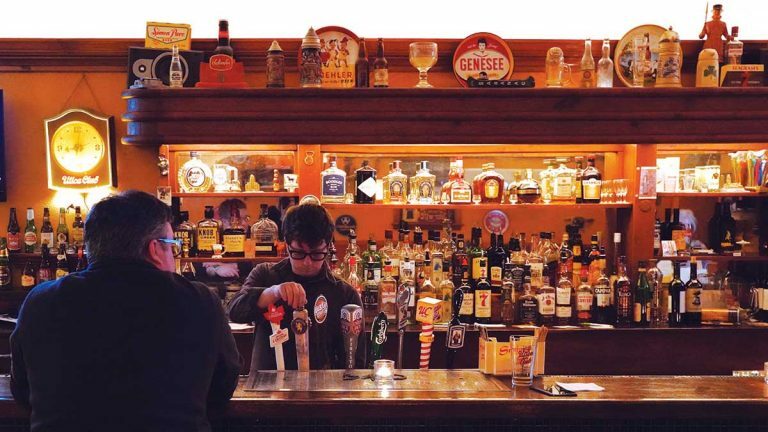 A quick glance through the 30 different beers and 70 liquors available at the Adam Mickiewicz Library and Dramatic Circle reveals this is no ordinary bar. Zywiec and Okocim beers are on tap, cans of Tyskie are in the fridge and bottles of Krupnik and more than a dozen Polish vodkas line the shelves. For the cost of a cover charge at a bar in a larger city – just $10 – visitors can become a member of this private club that has been a staple of Buffalo’s East Side for more than 120 years. It’s well worth it; the Adam Mickiewicz is one of the most unique drinking and cultural experiences in Western New York – and beyond. Arrivals from Poland in the 1890s built the club – which also features a library with centuries-old Polish books and an auditorium that’s Buffalo’s longest operating theater – as a way to keep the connection to their heritage strong. and Saturday night, and it’s not unheard of to still hear members sitting at the barstools speaking Polish.